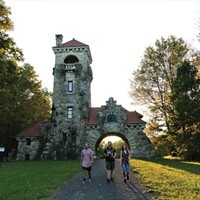 Testimonial Gateway at the Mohonk Preserve. Whatever the Huguenots saw in the Hudson Valley when they settled here in 1687, New Paltz still has it. Today, that means that New Paltz has something to offer everyone: from outdoor adventure and historic byways to cozy eateries, shopping, and arts and cultural events. Whether visitors plan a winter hike in the nearby Mohonk Preserve, or prefer to skip the hike and go right to the meal, eating is a must in New Paltz. The village proper is jammed with great options, from Main Street Bistro to Mexicali Blue to Suruchi Indian Restaurant. Of course as a college town, there are a fair number of delis and pizza shops, but the town also reflects its farming roots with many restaurants that cater to the farm-to-table scene, such as The Huguenot or Rock and Rye Tavern. Peter Ingellis, outgoing president of the New Paltz Chamber of Commerce, says the town's bohemian vibe is a big draw for all ages. "With the unique stores and restaurants, there's a real mix of retail and dining options available here that aren't available in other towns. It crosses all generations. Students are drawn to stores like Groovy Blueberry where you won't see older people, but there's [also] antique stores and high-end spots like Water Street Market, so there's something for all ages here." Ingellis credits long-established institutions like Historic Huguenot Street, SUNY New Paltz, and Mohonk Preserve with the town's success. "They are all community oriented and interested in seeing New Paltz successful and thriving," he said. SUNY New Paltz has a sterling reputation as the state's most sought-after college, but does a thriving town make a college attractive, or vice versa? The answer is clearly that they feed each other—sometimes literally. 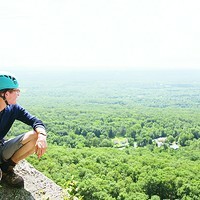 Students participate in local farming initiatives through the Phillies Bridge Farm Project and study ecology at the Mohonk Preserve, as they have since the preserve opened in the 1960s. While SUNY New Paltz is known for its excellent academics and funky college town, its position as a regional cultural anchor may not receive the recognition it is due. The college's Samuel Dorsky Museum of Art currently holds an impressive collection of regional and international photography thanks to a partnership with the Center for Photography at Woodstock. The Dorsky has more than 5,000 pieces in its permanent collection, with a focus on the Hudson Valley and Catskill regions. It is also known for its forward-looking exhibitions, such as the upcoming "Videofreex: The Art of Guerilla Television," which opens in February. Mayor Jason West sees New Paltz as a place that welcomes the new. "We're a very cosmopolitan village," West says. "You have a constant turnover of people bringing in a fresh perspective. It's a place where you can make change. It's very progressive, very open to new ideas, and it's just a place where you can do things like ban plastic bags. You can get a lot done and you can experiment, and the community is open to that." So what's in store for this historic-progressive town? Definitely further land preservation. 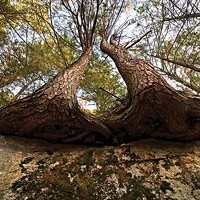 The Open Space Institute Land Trust announced recently that another 857 acres—the Mohonk Preserve foothills—have been protected through the Mohonk Preserve. Meanwhile, Wildberry Lodge is an indoor-outdoor water park proposed to be situated near the town's Thruway exit as part of a more than 250-room resort and conference center. While still in the planning phase, the project presents enticements and challenges to all who savor New Paltz's ability to continually change...and stay the same.